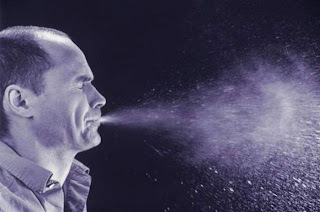 pseudoparanormal: Sneeze Alone, Lose Your Soul? For as long as anyone reading this blog can remember, when someone sneezed the social norm has been to follow it up with "God Bless You". It's even considered rude when you don't bless someone after they shoot their saliva and snot across the room at record speeds. But why do we make this gesture? There are a number of different origins to the line. One theory was that the body expelled the soul after a sneeze, potentially escaping the body, which would leave the person vulnerable to be attacked by evil spirits, luckily a simple "God Bless You" was able to protect the individual's soul from a satanic invasion. Another theory is that the heart stopped beating after a sneeze, so "blessing" the person would cheer on their little heart to keep-on pumping along. During the outbreak of the plague across Europe, the current Pope had ordered that the "God Bless You" was used after someone sneezed in hopes to fight off the plague. Since there is no way to test if people have souls to be expelled out in the first place, medical science has proven that the heart keeps beating before, during and after a sneeze and the plague...well lets just say the "God Bless You" line was not "just what the doctor ordered", it's safe to say that the world will keep on spinning whether you give a sneezing person your blessing or not. Instead of trying to be kind and courteous, my advice to you would be to avoid the snot barrage as shown in the picture above, then worry about giving your blessing. I found this funny and interesting because this is something I never really think about. It's just the social norm to say "God bless you" when someone sneezes, so most people never really give it a second thought. I was once told that your heart stops beating during your sneeze and that's why people say it, but guess not. Nice topic.